Addington Beach, Durban, lies on Durban's well-known Golden Mile beachfront, and boasts beautiful golden sands and clear warm Indian Ocean waters. Durban's Golden Mile, the sweep of beachfront stretching from South Beach to the Suncoast Casino in North Durban, is packed with Durban Beachfront and Durban CBD accommodation, as well as numerous Durban hotel accommodation options. Situated amongst the multitude of Self Catering and Hotel accommodation in Durban, a variety of popular restaurants and nightclubs contribute to the upbeat nightlife of the Durban Area. The Durban, Addington Beach is not as busy as neighbouring beaches, so if you're looking to escape the crowds, Addington Beach is the ideal tourist destination. Professional lifeguards ensure that all visitors are kept safe throughout the year, making it safe to swim, scuba dive and surf to your hearts content. Addington Beach is located right beside the impressive uShaka Marine World, which offers a world of entertainment, excitement, fun and laughter. When looking for Durban accommodation nearby, Durban Point Waterfront Self Catering Apartment accommodation is a superb location, making the Durban Point Waterfront a 'waterfront city within a city' on the Durban Beachfront CBD. - Amphitheatre Flea Market takes place every Sunday on the Durban Beachfront, and offers visitors a wide variety of stalls to browse through. - Blue Flag Beaches in KwaZulu Natal where you can expect properly maintained ablution facilities, professionally trained lifeguards, clean water, clean beaches, and safe parking. - Suncoast Casino is set amongst towering palm trees and nestled against the Durban beachfront along Durban's 'Golden Mile'. With 12 restaurants and fast food outlets, kid's entertainment, cinemas, sundeck, boardwalk and a dance bar, the Suncoast Casino offers something for everyone, and is a premier entertainment destination for the whole family. 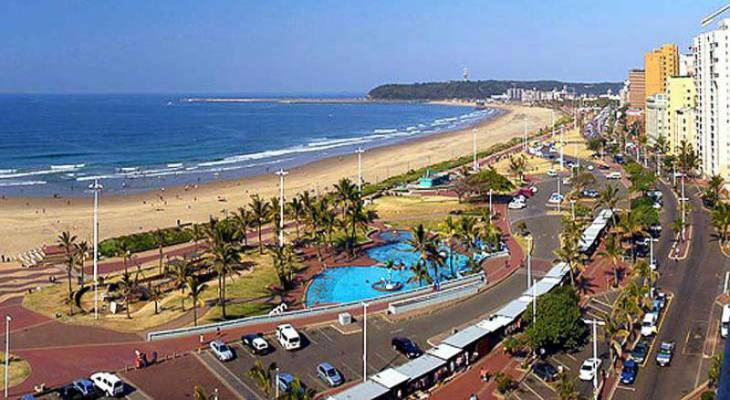 You will find plenty of Durban Beachfront CBD Self Catering accommodation and Durban Beachfront CBD Hotel accommodation near Suncoast Casino - find these on the Where to Stay Durban Beachfront CBD accommodation and Durban Area accommodation pages. Addington Beach overview. Addington Beach Accommodation and Information.